So half of the renovation project is essentially finished. We put a bow on the guest room last week and I was so excited to move the furniture back in and get everything put together. During the construction process, we’d moved the bed (mattress, box spring, head board, foot board), desk, and some other miscellaneous things out into a tent we set up in the yard. It’s a camping tent, and we put a tarp over it, so theoretically it should have been waterproof. But we were wrong. And when we moved some of the furniture out of the tent last week, we realized 99% of it was water damaged. The mattress and box spring were completely soaked. The bottom of the desk to about 5 inches up was soggy. I was disappointed. More time and money – wasted. So I headed to the mattress store. My mom offered to pay for the new mattress and frame, so I found a found a set that was cheap and comfy enough for visitors to sleep on. It was delivered the same day I ordered it, which means I didn’t have to wait too long to get the room completed. So what all did we do? I say we, but I really mean my cousins, Mike, and my mom. I was a useless spectator for most of it (though I did prime the walls and paint the ceiling in this room) because I had to work. They really only called on me when they needed my opinion or permission to do something. 1. Mike and I tore up the old, smelly, stinky, soggy, partially destroyed carpet before the hard work really began. 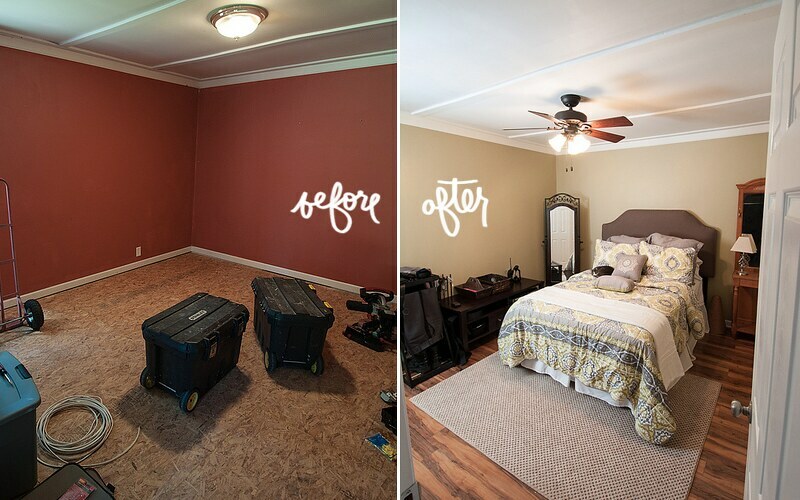 It was replaced with laminate flooring (from Lowe’s) that looks like the most beautiful hardwood I’ve ever seen. 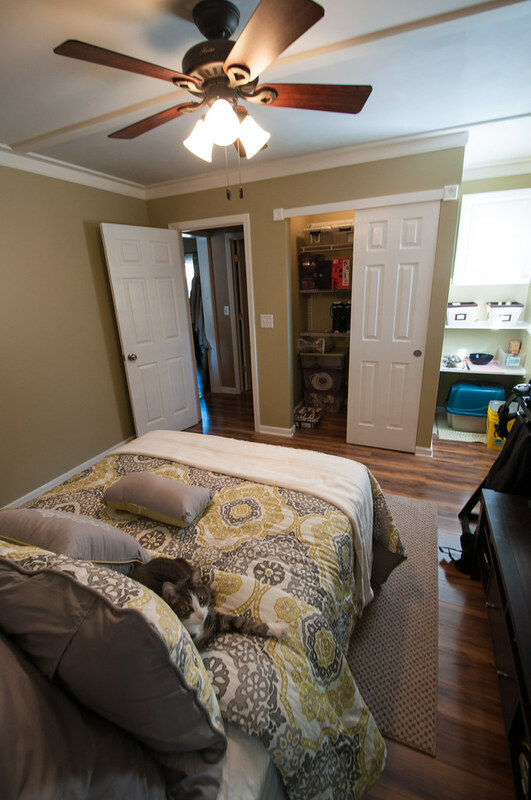 We chose laminate because it’s durable, easy to clean, and will be able to stand up against our pets. 2. We built the closet/entry way. 3. We got rid of the burnt orange paint and replaced it with a pale creamy green. 4. We repainted the ceiling and the trim a bright white. 5. We created the animal nook. 6. 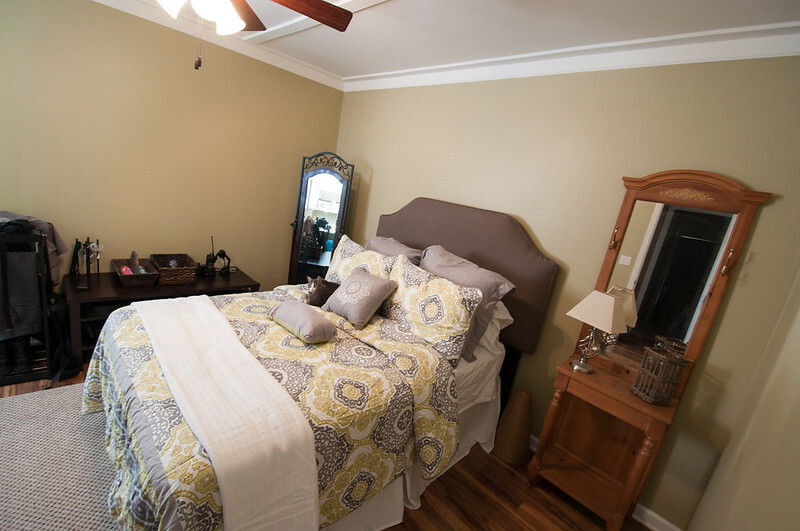 I really wanted a fan because…well I love fans, so we replaced the light fixture. 7. Mike and Tommy insulated the ceiling so now the room stays cool in summer and toasty warm in the winter! 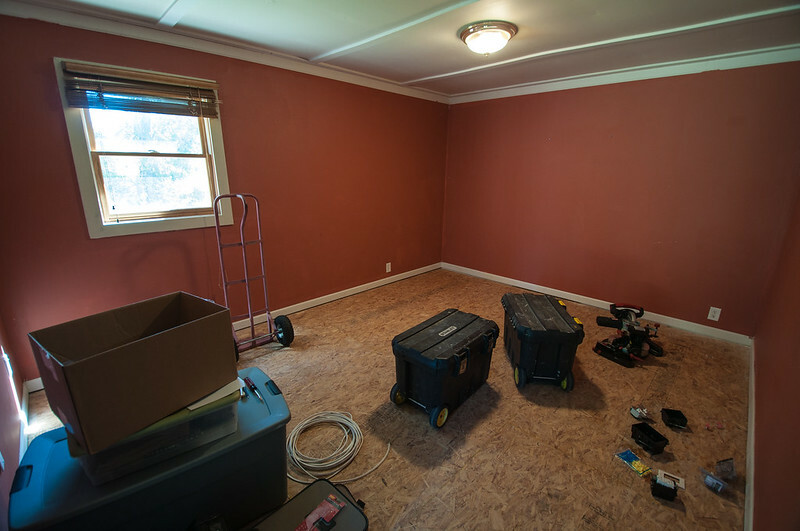 This room used to be a garage (many years ago), and when it was initially converted to a room, it wasn’t properly insulated. Until now, the room would either be freezing cold or stifling – not the type of environment you want your guests to experience. It’s much better now. My mom painted the AC vent cover, so it’s no longer a dirty, scratched up white, it’s now a dark brown that blends with the floor. 8. We patched a hole in the ceiling after Mike fell through during the process of installing the insulation. Yes. My husband fell through the ceiling. He didn’t get hurt at all, and was mainly just frustrated about the time set back. 9. My mom and I picked out all new bedding, and I snagged that rug from Lowe’s for less than $30 because it is a remnant piece and they just bound the ends. 10. And because of the tent mishap, we purchased a new mattress, box springs, bed frame, and head board. 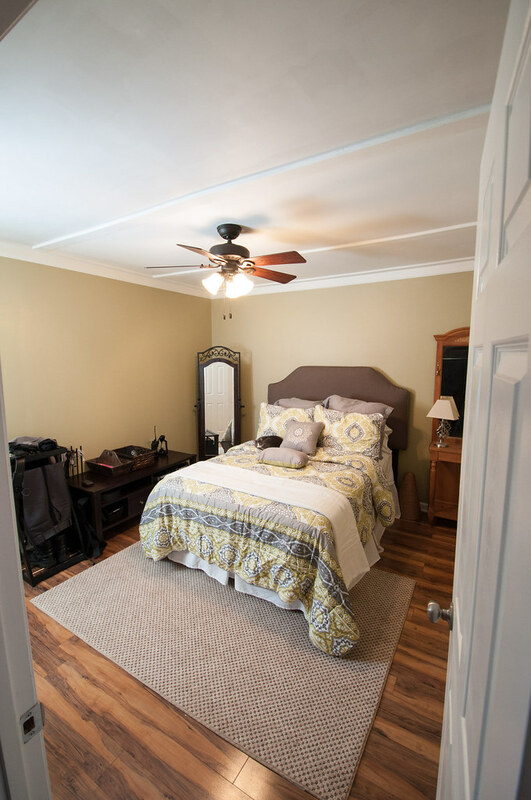 I could not be happier – especially because now we have a CLOSET, plus that little entryway/hall, which means you don’t have to go through the guest room to access the laundry room. 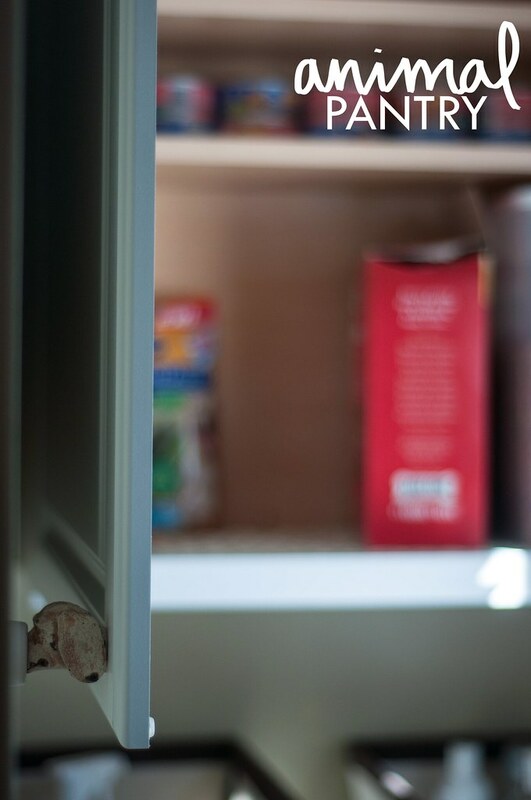 Another addition that I really like is the animal nook/pantry. That corner over by the window is now a dedicated pet space (complete with doggy doorknob) where we feed the cats, keep one of their litter boxes, and also store the food and other pet-related items (like flea meds, shampoo, toys, treats, etc.) It’s taking up less room in other places of the house now that we have a special spot for it all. And since we don’t have guests very frequently, it’s not in the way of anything. I also moved Mike’s dressing station and work things into this room. Because of his weird hours, he would usually get up and get dressed and ready out in the dining room to avoid disturbing me, which meant this was also where he was getting undressed after work and storing all of his Sheriff related things. I didn’t want the dining table to be a permanent gun/bullets/radio/uniform landing station, so I relocated it to the guest room. And now he has extra space to get ready. So there you have it! Stay tuned for the bathroom reveal! Love, love, LOVE the comforter!!!! LOVE IT. 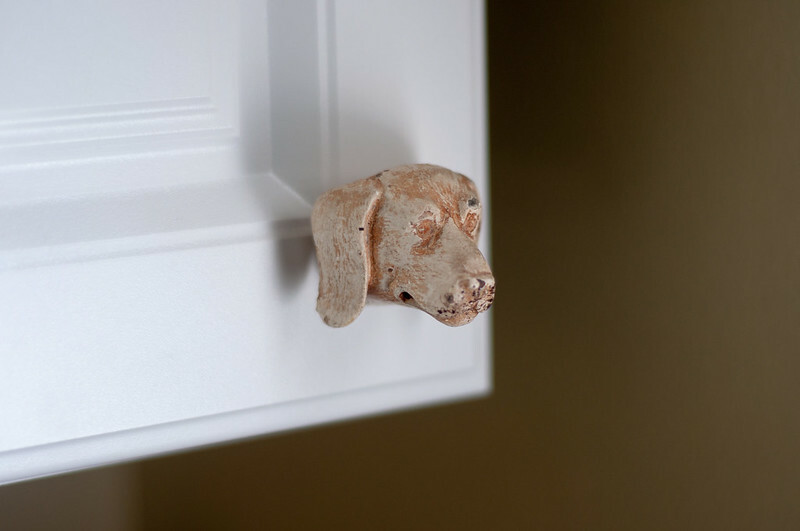 The dog door knob is too cute! !